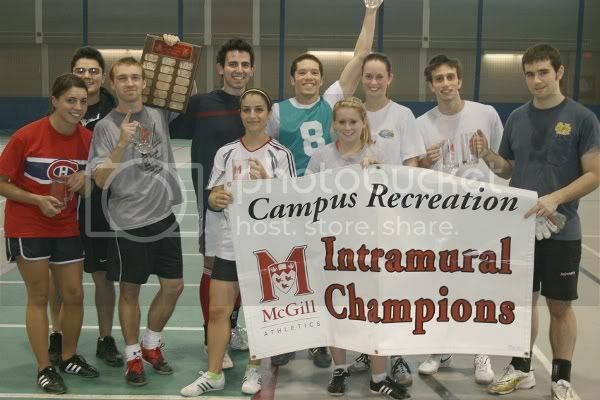 Spring/Summer Intramurals have become an established tradition of the McGill sports community, gaining considerable popularity since their inception in 2005 and continuing to grow in numbers through time. We started with 13 registered teams and a single division our first year, growing to nearly 30 teams in three separate divisions last Spring. This year unfortunately, a variety of factors have limited our field time's availability. By making some compromises (the most notable of which to play only on week-ends) we were however able to launch the league for a 6th consecutive year. For our first month (May = Spring) I am glad to report we were able to accommodate 28 teams! We hope registration will continue with the same enthusiasm for the months of June & July. In Spring 2010 following the 5-game regular season, all divisions will have a single elimination playoff in order to crown a champion. 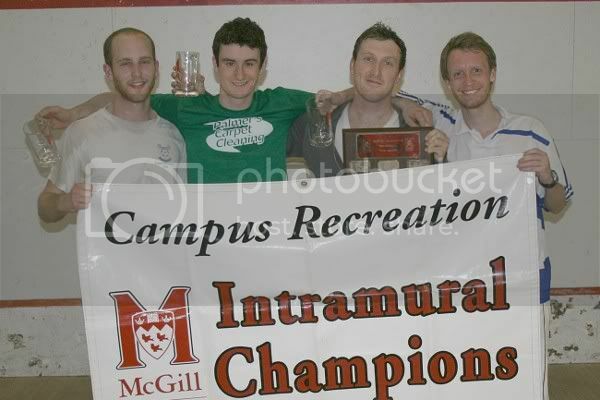 Players from each winning team will be eligible to receive the very prized McGill intramural mugs!!! Great sunny weather is finally here folks!! 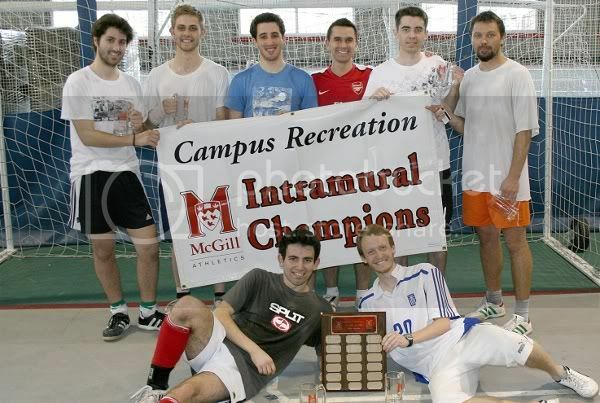 The arrival of Springtime correlates with the end of our Winter 2010 Soccer Intramurals, which just capped a semester of tightly contested footy action this week-end and bestowed yet another batch of "silverware". I use inverted commas because that is but an expression, for when we describe our trophies it is more accurate to be speaking of GLASSware. 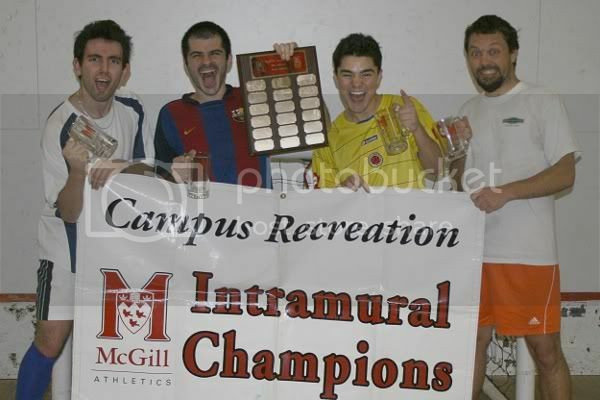 Yes I am talking about the highly sought-after McGill Intramural soccer mugs!! These mugs sure are prized possessions, aren't they? 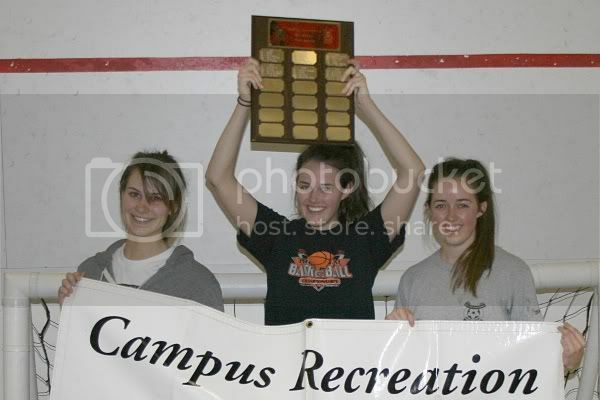 The dream of every intramural contestant! While pro footballers fantasize about hoisting the golden World Cup in a stadium filled with thousands and thousands of people, us mere mortals (for which the glory of a pro soccer career is but ephemeral illusion) have more modest aspirations. Oh yes. Forget about Ballon d'Ors, forget about UEFA Champions Leagues, forget even about Community Shields & Carling Cups. The only way to recognize a soccer God in all its glory, is to see him/her raise a glass mug filled with beer atop of the Tomlinson Fieldhouse or Molson Stadium. That is the mark of a true champion! Pardon my cheap philosophical ramblings, but I mentioned soccer mugs for a reason. Indeed, some of us here are accumulating quite a little bounty. For instance, how many do YOU have now? One? Two? Maybe four or five? Try 16 for size! And who is the lucky record-holder? All will revealed soon, just as soon as I finally get that "Individual Records" page finalized in the Hall of Fame section. Anyways I won't keep you for much longer: I'm sure you all got your final exams to study for. 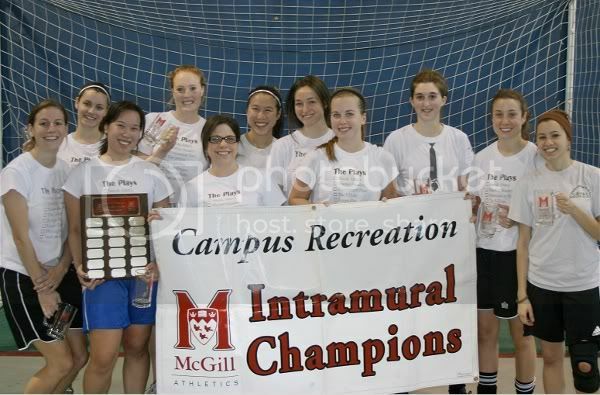 Before I leave, a quick note on Spring & Summer Soccer action here at McGill Intramurals. As many of you know Molson Stadium is currently undergoing renovations, and Athletics is renting out our outdoor facilities for most of the Summer to third parties. All this unfortunately means there isn't much time left for us, and for a while it seriously looked like Spring Intramural soccer was going to be canceled, plainly and simply. However REJOICE people! 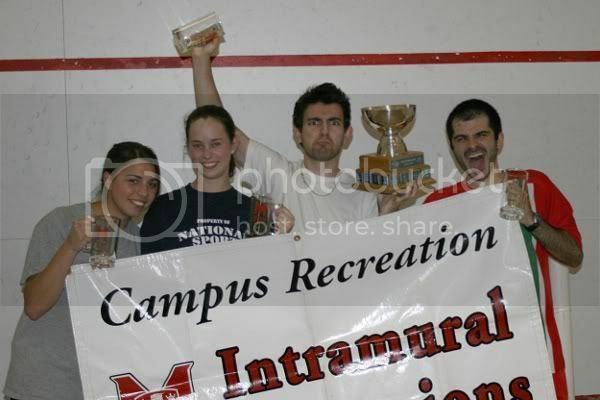 It looks like accommodations will be made and we will have Intramurals this Summer after all!!! So stay tuned for more news in the coming days. The only restriction this year: for the month of May at the very least, we must play on WEEK-ENDS only (Saturday / Sunday). Updates very soon. In any case if you're in Montreal this Summertime, we strongly encourage you to partake in the most beautiful sport in the world with us! See you all very soon on the fields of Molson Stadium and Forbes Field! Well, we did it folks!! The soccer intramurals record for "highest goaltotal ever achieved by a single player has been broken, and the 2v2 Men's A was once again a main witness to the event. After the Winter 2010 semester, Abdullah Alkhuzai's previous record of 101 goals in no more and IM Soccer hails a new record-holder. His name is Stephan Dalkie and he plays for Galacticos FC. Tallying a mind-boggling total of 119 , Stephan stormed by the opposition to claim the Winter 2010 MA tospcorer title, well ahead of 2nd-ranked (yes, him again) Ahmet "AC" Turkdogan (Bank Shot, 107 ) and previous record-holder Abdullah Alkhuzai (Span-Arab Connection, 75 ). In Men's B, the race was much less enthralling in that leader Hai-Son Nguyen already had a comfortable lead on his rivals at our previous update. It's no suprise then to see the Polar Bears player finish in 1st position at the end, and with 91 he's not very far from the 100 goals cap! Who knows what Hai-Son would have been able to achieve had his team qualified for the final match? Easy Lays' Sindre Haugetraa (fresh of winning the team championship) and Polar Bears' Simon Turcotte complete the podium at 2nd & 3rd (with 74 and 66 respectively). Down in the ladies' category, the Women's A final match pitted JACK's Casey Conway and TBA 2's Kyrin Dhaliwal in a very exciting head-to-head showdown for title supremacy (both in team & topscoring terms). Ultimately the soccer Gods favored Casey in every way, because not only did her team claim the championship (succesfully defending their November 2009 crown) but the JACK player also came out on top of the scoring charts, totalling a respectable 66 (i.e. 8 more than rival Kyrin) and earning her a most treasured double. TBA 1 captain Zoe Prowse completes the podium with 53 . Down in Co-Rec A, team Cool Whip and team Here for Beer set off to a thrilling final encounter on Tuesday, a fixture which also pitted our two scoring leaders in a head-to-head challenge. It was indeed a match-within-a-match for team captains Anna Nathanson and Sindre Haugetraa, Anna kicking off with a small +4 lead over his male counterpart as the game began. After 3 sets of intense 2v2 action, that lead was no more. Not only did Cool Whip win the championship mugs, but Sindre also grabbed the Winter 2010 CRA topscorer title in one swift overtake maneuver. The Norwegian Rabona specialist finishes the season with 66 , four more than Anna who may console herself with the title in the female category. 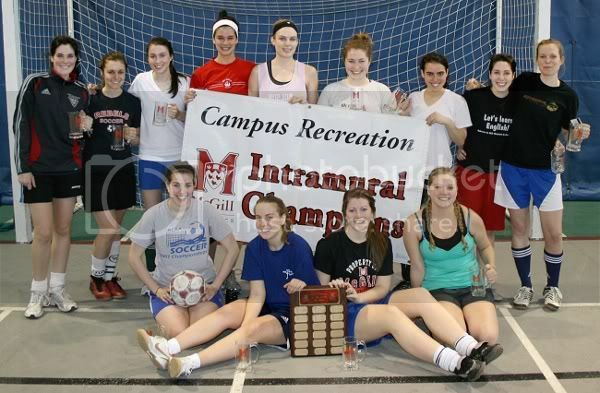 And lastly in Co-Rec B, we did indeed break the 100-goal mark! 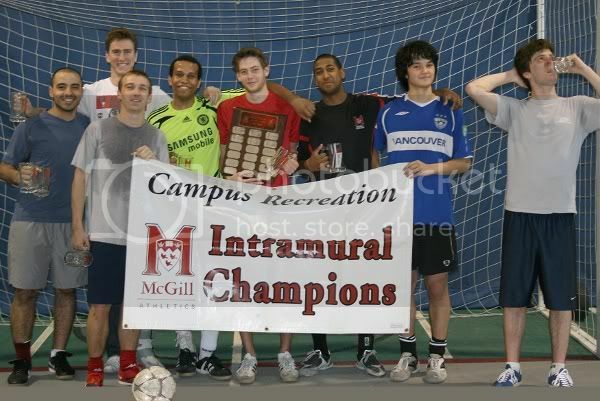 It wasn't enough to make the annals of intramural soccer history, but it represented a record nonetheless. 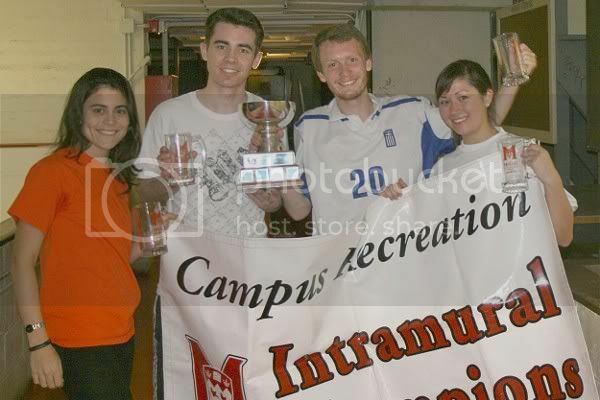 Indeed, by totalling 103 and grabbing yet another topscoring title, Tenacious D Fans's Ahmet "AC" Turkdogan obtains the 11th shirt-prize of his career, celebrating doubly by also obtaining intramural mug nº16 as Tenacious D Fans win the championship. Smurftastic's Arthur Omont ends just 3 goals short of glory. In the female category, it was Lasers and Neons's Mary McDonough who ranked highest with 40 . Once again, contratulations to all the winners!! !